Ward 6 Council member Tommy Wells stated at the SWNA forum that “We need to make sure we have the public infrastructure that serves the neighborhood.” The nearest Metro station is over a half mile away and the route that pedestrians would use to arrive at the stadium would need to be upgraded. There are two streetcar routes that are planned to terminate in Buzzard Point – the North-South streetcar line and the Anacostia line. These lines are not scheduled to be completed until 2020 at the earliest; however, the DC Council recently voted to cut streetcar funding for future lines. The Special Events Study for Near SE/SW concluded that there will be major congestion at key intersections due to vehicular and pedestrian traffic on game days, especially when multiple events are occurring, such as a soccer match, baseball game at Nationals Park, or a concert at The Wharf. In an effort to alleviate traffic in the residential area north of the stadium, there is a proposal to convert Half Street from P Street to Potomac Avenue to a “festival street” during game days similar to Half Street, SE during Nationals games. During the 2012 MLS season at RFK Stadium, between 37% and 41% of attendees used alternative transportation options to automobiles. It is expected that the non-automobile share will be higher at a Buzzard Point site (65%) despite the longer distance to Metro than at RFK, since parking will be limited nearby and will be more expensive. About 6,400 parking spaces within walking distance have been identified across several lots, many that are also used for Nationals games. Approximately 610 spaces will be located in a parking lot across the street from the stadium at Akridge’s 100 V Street lot until that site is redeveloped as a mixed-use project. Most of the spaces are located in parking lots east of South Capitol Street near Nationals Park. As these lots get developed, parking will be lost, but some will be built as office buildings with parking garages that can be used by soccer patrons. While the stadium will open in 2017, the new Frederick Douglass Memorial Bridge and traffic oval will not open until 2018. 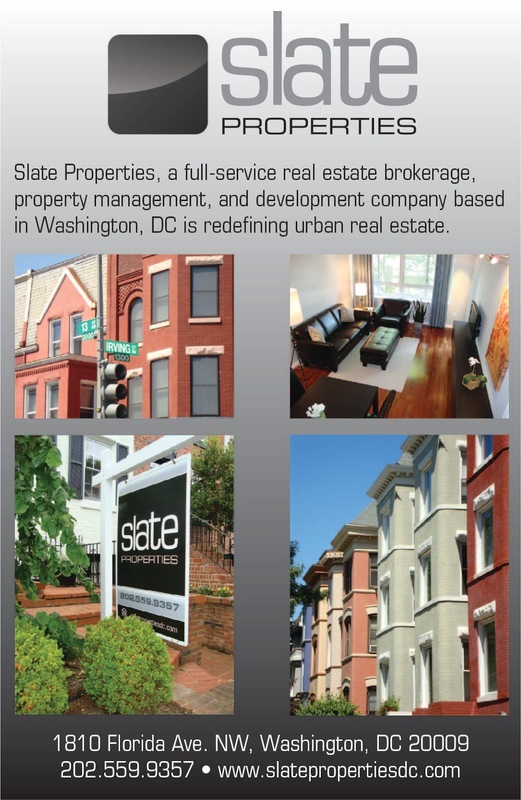 Therefore, access to parking facilities near the Anacostia Metro station will be limited. Further improvements along the South Capitol Street corridor will be completed in a later phase. It is expected that the tailgating culture that exists at RFK Stadium will be replicated in some form at the new DC United stadium. Most likely this will occur at limited tailgating areas, but supplemented with restaurant/bar gatherings, and meet-ups in public spaces such as festival-like street closures. These pre/post-game gatherings are very prevalent at European soccer games and urban MLS venues. 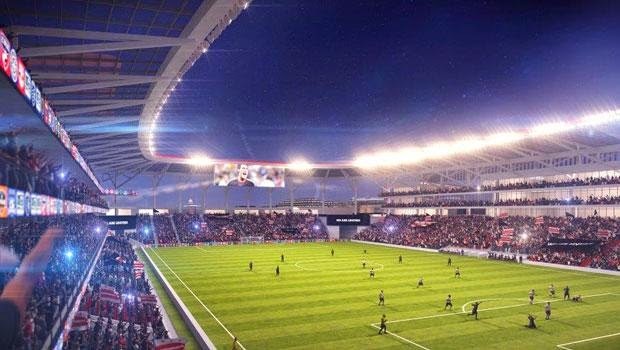 Although the stadium design is very preliminary, DC United staff has indicated they plan to designate a portion of the stadium site for this type of game day activity. Over the summer, the Community Benefits Coordinating Council has been meeting with neighborhood stakeholders to develop a Community Benefits Agreement to ensure that residents who live nearest to the proposed stadium site benefit from the project and are not displaced. Negotiations will soon begin with the District and DC United on the CBA. The initial terms of the CBA include a $5 million community fund for youth activities; workforce development; training for area residents; small business opportunities; housing; and traffic & safety issues. Council chairman Phil Mendelson was at the SWNA forum and gave some additional color on the proposal from the perspective of the DC Council. There are three committees that will be evaluating the pending stadium bill – Government Operations, Economic Development, and the Committee of the Whole. Hearings have been held on the stadium, but more will be scheduled before any votes are taken. It is highly unlikely that the Council will vote before the November election, but will likely vote before the end of the year. The Council is waiting for consultant CSL International to finish a cost-benefit analysis on the stadium deal before they move forward. 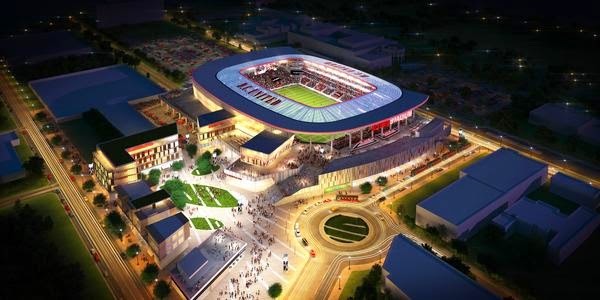 According to Mendelson, there are two separate issues before the Council – the stadium serving as an economic development booster and whether the city wants DC United to stay in the city. If the stadium proposal was just for $150 million, Mendelson said that he believes there are enough votes to pass the bill. 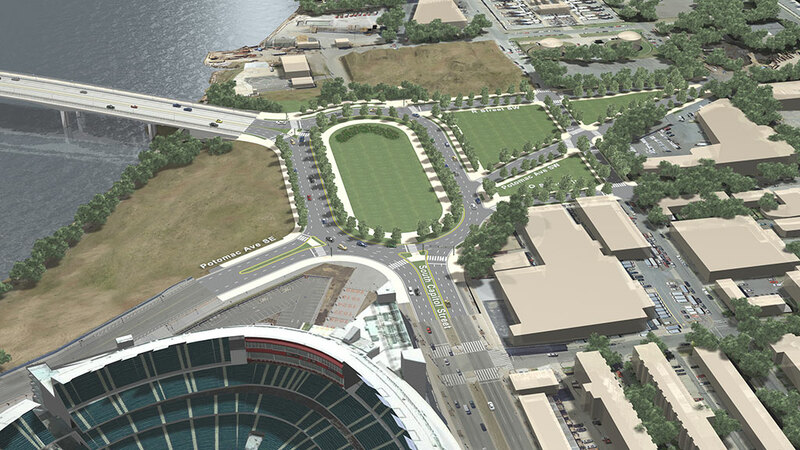 However, the stadium proposal is complicated, involving a series of land swaps, tax abatements, and other provisions, so the bill's prospects in the Council is uncertain. I like the idea of connecting the development around the soccer stadium to the "Capitol Riverfront" (I hate that name), but I do hope at some point attention IS focused north of the stadium site between M. That area needs some TLC. Also, I don't see the point of the Reeves/BuzzPo swap, but if the city wants to do it to bring a stadium to SW, by all means... But I'm guessing that detail will be what snags this deal.